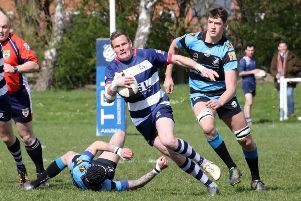 Sean Bannister ran in a hat-trick of tries as Banbury Bulls resumed normal service at Dunlop. The Midlands Two West South leaders picked up another bonus-point victory with a 41-14 victory but were pushed all the way by a resolute Dunlop outfit. The home side provided quick ball and used their big forwards to make ground and test Banbury’s organisation. Possession and territory swung one way then the other with both side punished harshly at the break down. Bulls broke the deadlock when fly half Sam Stoop found touch ten metres out. The line-out was slick, the forwards gained momentum in the maul and Banister timed his charge for the line and Ed Phillips added the extras. Bulls had the majority of the ball and field position for the remainder of the half and Phillips added three points. But Dunlop’s defence pressured Banbury and they turned the ball over in their 22 several times. In the final play of the half Dunlop marched down field, were awarded a penalty under the posts and captain Mark Challis took a quick tap to crash over, leaving an easy conversion. After the restart Bulls found it difficult to produce their flowing rugby. But they did stay strong with just 14 men following Simon Brand’s yellow card, having the upper hand in the scrum. The return of Brand kicked Banbury back into life. An attacking scrum gave the backs a platform to play from and Joe Mills ran a cutting line, Sam Stoop found him with a long miss pass and the visitors extended their lead with Phillips adding the extras from out wide. The game was in the balance, Dunlop needed to get their hands on the ball and keep it tight but it was the visitors who were able to shift through the gears. From the restart forward runners made ground, the backs went wide, but Dunlop scrambled well in defence. A second yellow card for Dunlop saw the game shift in the Bulls’ favour. The tries started to flow, Phillips crossed the line twice, converting both while Banister added two more to complete his hat-trick, as Bulls moved 41-7 ahead. To Dunlop’s credit they did not give up, showing why they had won six out of their last seven games, and a training park penalty move opened up the visitors’ defence as the hosts went over under the posts. Dunlop rallied to try and get a four-try bonus point which would have been deserved but the game fizzled out as Bulls ran the clock down.